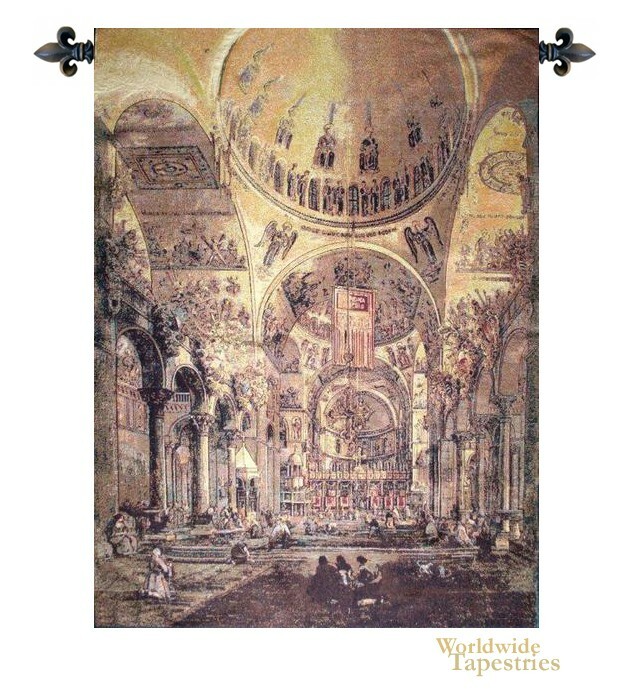 In Inside San Marco tapestry we see the incredible interior of Patriarcale di San Marco or Saint Mark's Basilica. Here we see the interior of marble floor, the mosaics which covers the upper section of the entire church, the roof and ceiling which shows artwork of 29 scenes including the Ascension of Christ. The people are in period costume and shows their devotion in this incredible feat of architecture. This Inside San Marco tapestry is backed with a lining and a tunnel for easy hanging. Note: tapestry rods and tassels, where pictured, are not included in the price.